Thanks to Ray Derksen,John Greenwood, Darmaris Katt, Beth Hagenbuch and Adithya Ramachanrdan for helping Wally lead last week’s meetup. and sharing their end of the year assessments in 5 areas: crops, marketing, work flow, gear and revenue. The main theme was in-season revamps to farm plans are now the rule rather than the exception. SPIN farmers are constantly having to change throughout the season in response to food trends, customer tastes and competition. What that means for 2018: 2 plans – one that is “core”, based on predictable, steady best sellers. And another that is a flex plan, based on more niche, experimental crops that can be changed out quickly throughout the season. Real-time analysis and record keeping are more important than ever. Lots of software out there to help you do that. Flowers are a blooming trend, along with farmers having to take a more active role in building traffic to their farmer’s markets. Finding motivated labor is a key challenge, and controlling costs is the top 2018 priority. 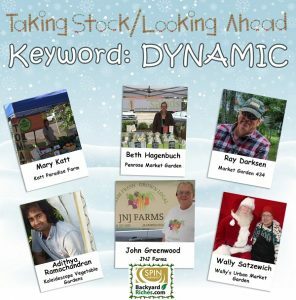 Lots more insights on the current state of the backyard farming business in the replay. Now playing 24/7 when you log in here. Not a member? If starting a backyard farm business, or learning the business of growing food, is on your New Year’s to-do list, you’re welcome to join in, and learn from us here.